I got this knife as well and would like to tell you my impressions of it. The knife came in an HX branded simple cardboard box and was VERY sharp. It had a huge issue out of the box - significant side-to-side play, which also affected the centering. I tried to tighten it down, but it has a free-spinning pivot, that was also locktited with that strong white kind(I hope the person who thought of/did that gets his ahole locktited as well). So I tried to disassemble the knife and after lots of effort that included applying the hammer - I was finally able to do so. It seems that the pivot screws are simply too long (or locktited too much), so even if tightened all the way, they still don't keep the whole construction tight and free of bladeplay. I also discovered that it had very narrow nylon washers that weren't doing a very good job. Anyway - I have replaced the washers with a thicker nylon ones, added 2 bronze ones under the pivot caps and assembled the knife back. It fixed the blade play and made the knife function great - smooth and solid. - Extremely sharp blade out of the box. That (combined with a thin flat grind and great sharpening) make it (surprisingly) an excellent slicer. - The unique features. It features a carabiner at the tang, that allows it to be easily attached to a keychain or a loop. The inset frame/liner lock. The Ganzo style skeletonized carbon fiber laminate as a linerless scale. The 2 tone blade. - The steel. HX Outdoors know how to make a very decent AUS8 blade. - The Poker game theme. 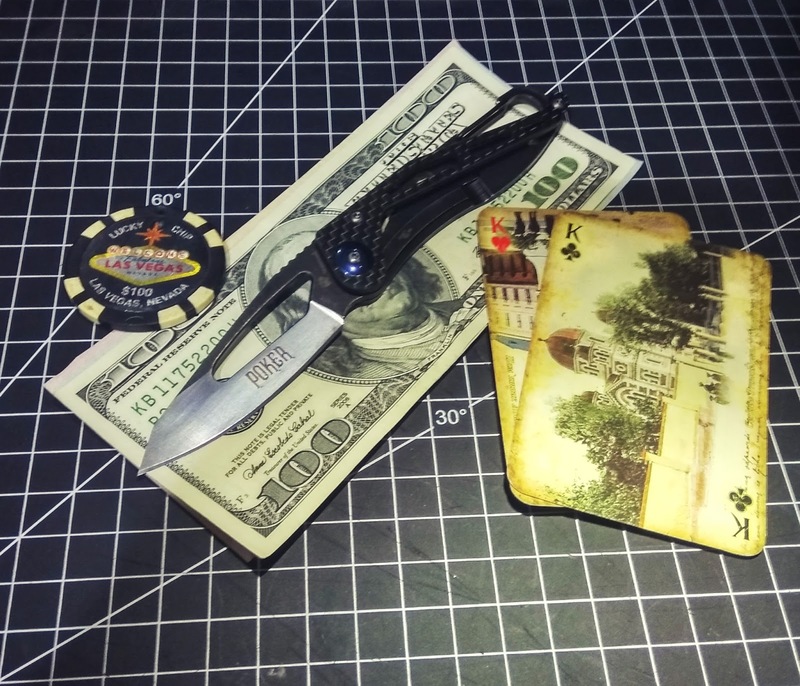 The word "POKER" is written on the blade and all the suits appear on the pocket clip, and that adds another dimension to the knife. - Slim profile and very lightweight. - All the fit issues I mentioned in the First Impressions - locktited free spinning pivot screw, horizontal bladeplay and the narrow washers. - The pocket clip is tip down only and is too long IMO. - The opening in the blade is too large IMO. A smaller, different shape one would work much better. - Ergos. Are OK, but the knife doesn't sit comfortably in my middle-sized hand. Definitely not the best quality knife I got recently. Still don't know if I got a "lemon" or they are all like this. 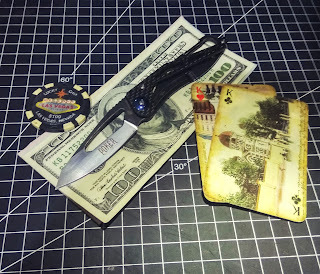 Reasons to get it - if you really want a poker themed knife or would like a slim and light knife that has a carabiner at the back and is a decent slicer. If you are a knife aficionado or are new to knives - you better skip this one and better choose one of the usual suspects. Very well might be so. Wonderful article to read. I was looking for a lightweight pocket knife for a long time, but can not decide which one is the best. After reading your review, everything seems to be easier.